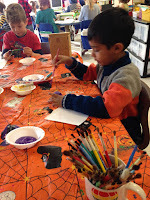 I have been thinking about doing a presentation in Lil A's class about Diwali. I couldn't manage to do it last week, but asked and scheduled a time this week. It was first time speaking to a bunch of kindergartners. So, I was nervous. I took some pictures for kids to color and clay diyas to paint for their activities. I wore a sari and even took an extra one for the teacher. But the most fun part was interacting with the students. These 5 and 6-year olds had interesting questions, were engaged and entertaining. 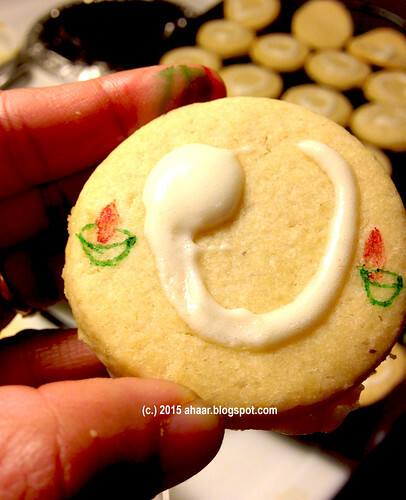 I wanted to take some treats to class and instead of Indian mithai, I decided to make some cookies. This was my first time making cookies. I was super nervous. What if they turn out hard as rock? My plan B - take bourbon cookies if this fails. Luckily, I didn't have to go to plan B. The cookies turned out moist, soft and buttery. 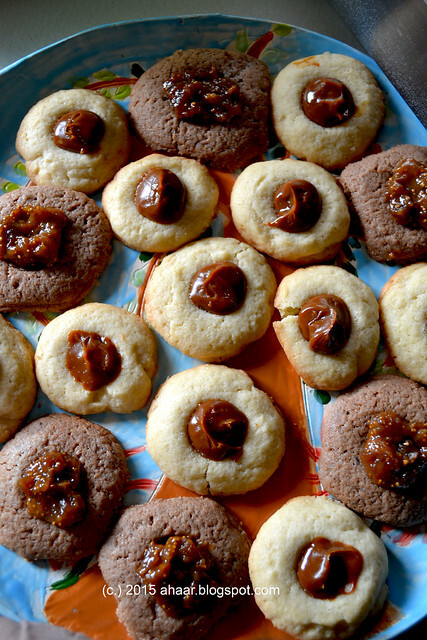 They were not too sweet, so this would make great holiday cookies too for decorating. 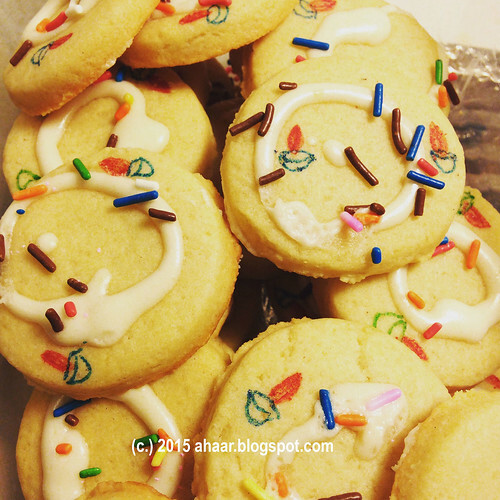 I made some diya (lamps) on the cookie with edible markers a tiny splash of whipped cream in the middle and a tiny bit of sprinkles. Don't they look festive? 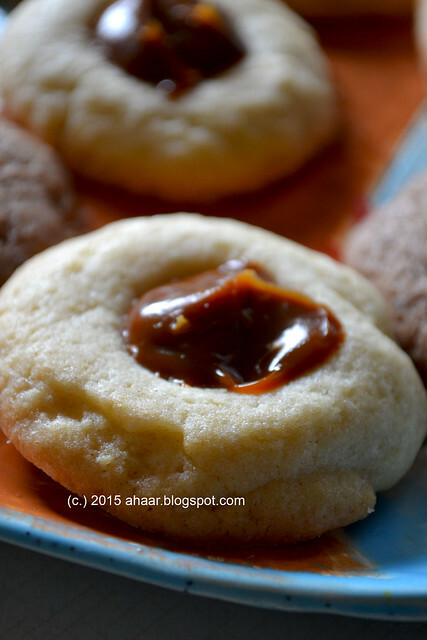 Combine flour, salt, baking powder, cinnamon and cardamom. I like to sieve it once to get it all smooth. Cream the butter and sugar together for 4-5 minutes till it turns creamy. Add in the egg and vanilla and mix again. Then add the flour. At this point I like to use my hands to get the dough together. Don't overmix. Once it's all together, make it in a disc shape and chill. I chilled it for about a couple of hours and then rolled it out on some flour. 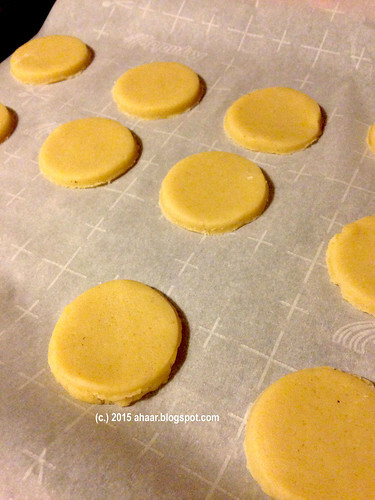 Cut round discs and put it on parchment paper on a baking tray. Preheat the oven to 350 degF and bake the cookies for 12-15 minutes. 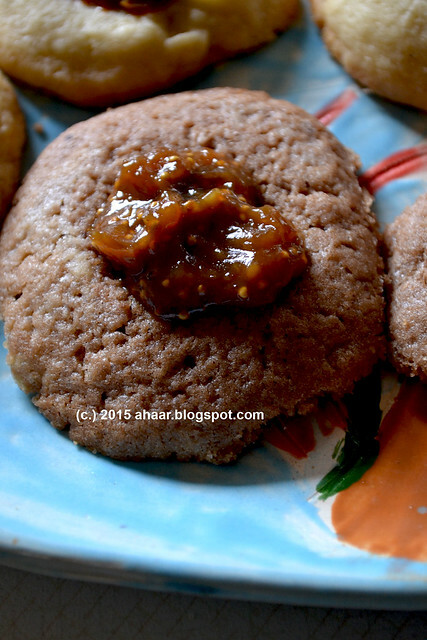 One trick to keeping it soft - don't let the entire cookie turn brown. Look for the edge, once they start to turn brown, time to take the cookies out. 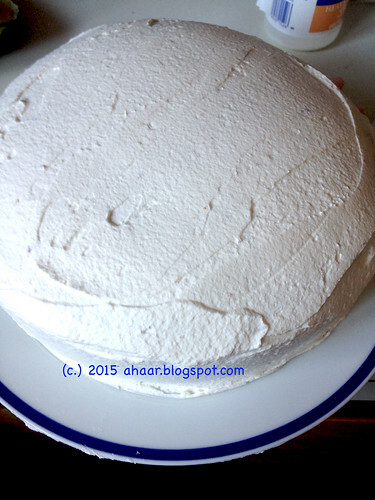 Let it cool completely before decorating. Enjoy! Happy Diwali. 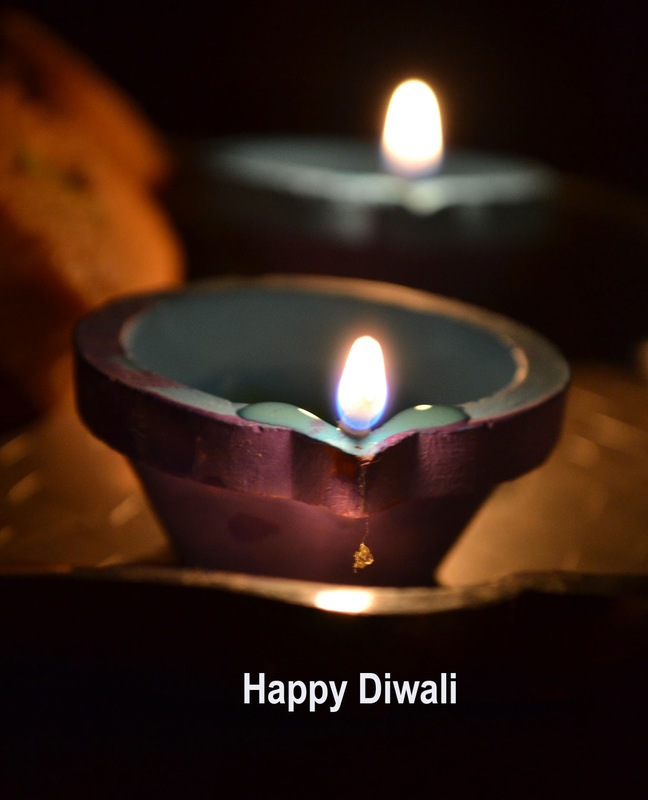 Wishing you much happiness, success and prosperity. 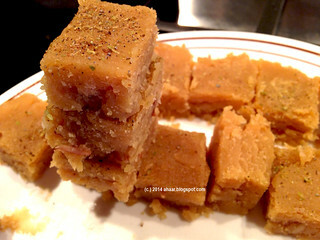 If you are like me and looking for last minute sweets recipe, here are a few recipes that we have enjoyed making over the last few years. 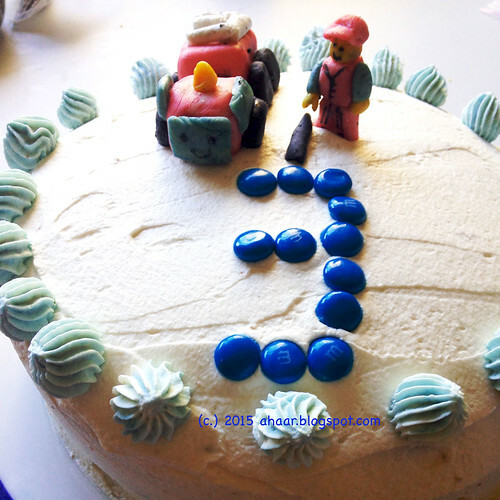 Tiny M is turning three and he asked for a fire truck cake. Fireman and fire trucks are his most favorite thing at the moment. He also dressed up as a fireman for Halloween. 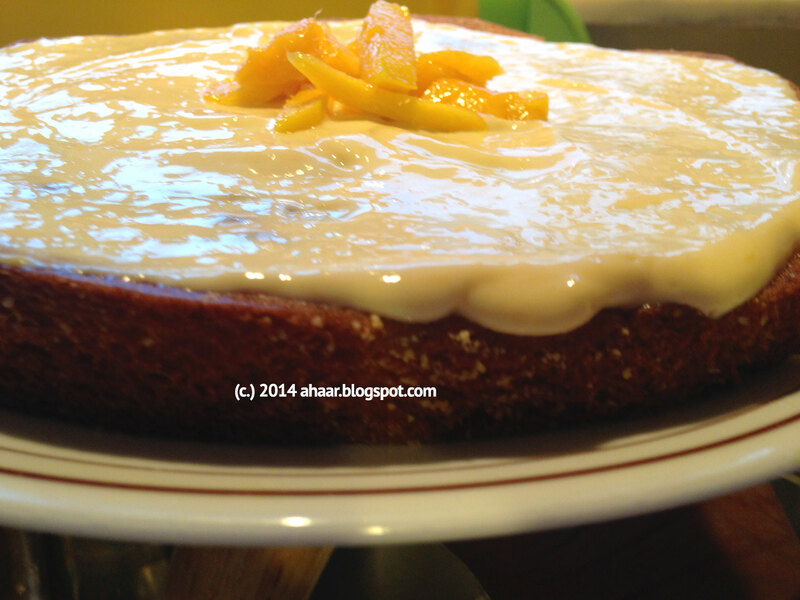 As I was getting things ready for his cake, I remembered when I first baked a cake. I can begin the story - Long time ago :) It was in a studio apartment in Washington DC. I had moved there for my first job and barely had any utensils or things. But it was almost Christmas and I was in the mood for something festive. So I picked one of the cake in a box from the super market along with some whipped cream for frosting and baked in an aluminum foil pan. It was thrilling to see the cake rise and then taste it hot off the oven. We were so thrilled with the result, I think Aswin and I had cake for dinner. For Tiny M's cake this year, I chose to do something experimental (inspired by the Great British Bake Off I have been watching on PBS). I grated one carrot, and zested a lime and a half and made a lime and carrot cake. 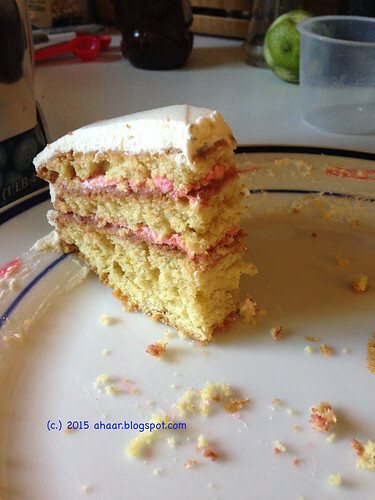 The result was a really fresh flavored cake, with neither carrot or lime overpowering it. Heat the oven to 350 degF. Butter and flour cake pans and keep is separate. Sift the flour with salt, baking powder and baking soda. Keep it aside. Zest the limes, juice one lime and keep it aside. Similarly, grate the carrot and keep it aside. Break the eggs and seperate the egg white and the yolk. Put all the egg white in a bowl and whisk till it gets all foamy and soft peaks form. Keep it aside. Mix about 2 tbspoon sugar with the yolks. Now mix the sugar and the oil and whisk it nicely. Then add the egg yolks and whisk for a minute. Then add the flour, buttermilk, lime juice and carrots in three batches. Once it's all mixed together, slowly fold in the egg whites and the lime zest. It's best to do it slowly. Pour the mix in two cake pans and bake it for 25-35 mins till the toothpick comes out clean. Let it rest and get the frosting ready. I made two batches of whipped cream. One with color for between layers and one white for the outside. 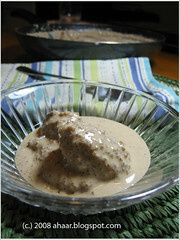 Whisk chilled heavy cream, sugar and vanilla together till soft peaks form. Layer it in cake and outside as smoothly as possible. It's Durga pujo time. My Facebook feed is full with pictures of Durga pandals and idols from Delhi, Mumbai, Bangalore and Kolkata. How things have changes in just a few years! When I first came to the U.S., I used to long to see dugga thakur from home. Now I am able to see different pratimas (idols) and be a virtual participant in the pujo, see the saaj goj, the food, and the pandals. Aswin's had a couple of deaths in his family, so we are not celebrating this year. It is going to be a quiet pujo for us. 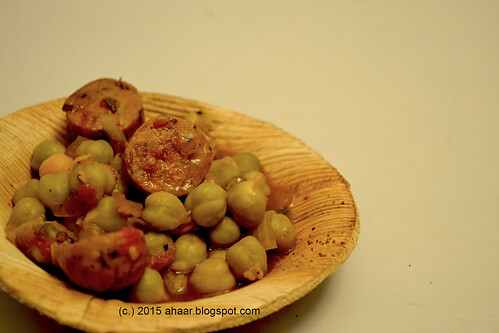 I want to share the recipe I made for Kerrytown Project last month - green chickpeas with sausage curry. 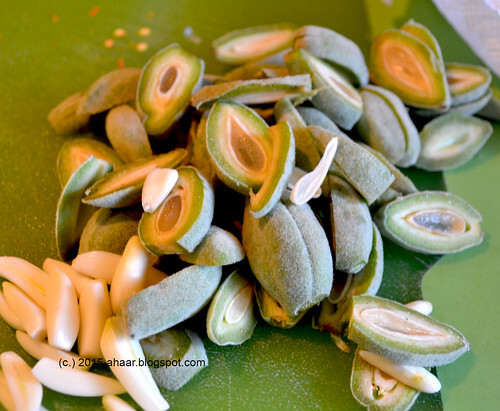 When I found the green chickpeas at Patel brothers, I knew I wanted to make it for sampling at Kerrytown. So I bought a few pounds. Then, the question was to cook it with ground meat or not. I decided against ground meat and went with sausages instead as it complemented the juicy, crunchy chickpeas. Lil A is settling in kindergarten and Tiny M is not full time in daycare/pre-school. They are settling down well. They come home with stories of what they did, who their new buddies are and what was the fun part of the day. They also come home tired and sometimes cranky. What worked in pre-school for Lil A doesn't work anymore. So I have been looking for snack and or lunch ideas for them. It was during this time, I came across the idea of making a fruit roll up for snack. It's rather simple. The first time they tasted, they didn't like it. But I think it is growing on them. Here is the recipe for the fruit roll up. The last week before the move was particularly hectic. We were trying to get the new house clean and set up the kitchen before the movers came. Having parents who would spend time with the kids, and also have a delicious hot meal when one comes home tired and sweaty was a blessing. 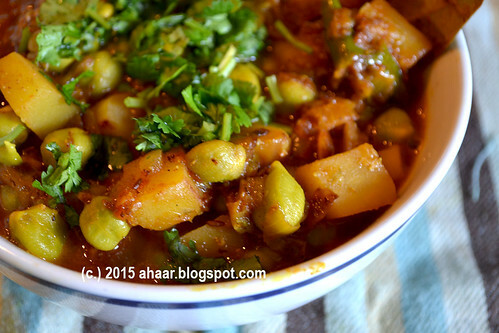 It becomes even more special when when my mother made this lau-er shukto. Eating it with hot rice, I had to ask her the recipe and note it down for the blog. 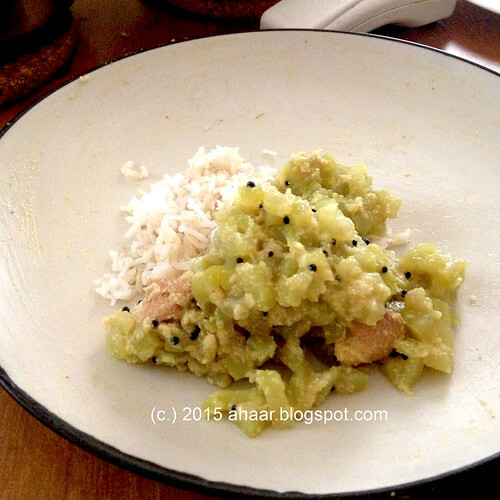 She said that typically this dish is made with shiuli leaves, which are bitter. 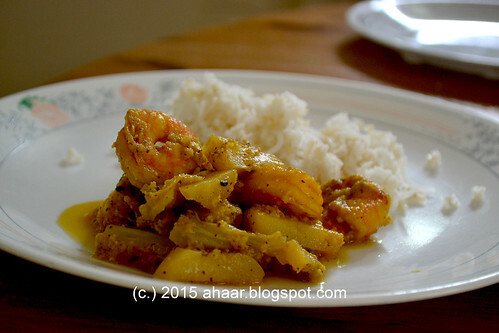 Since we didn't have it, we substituted it with karela or bitter melon. The bori (lentil dumplings) in this are usually matar dal er bori and again, I substituted it with regular ones that were in the pantry. It makes for the perfect first course. It was hard for me to give up my little veggie patch in my old home, but was thrilled to find a little patch in the new place as well. The previous owners had planted just tomatoes and when we moved in the tomatoes were starting to ripen. Since then we have been harvesting some tomatoes every week. 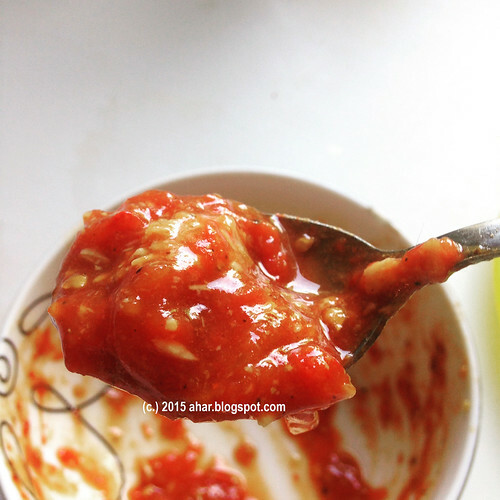 I recently posted on Facebook asking for recipes for using some of the tomatoes and one of the readers - Christina Roy- posted a recipe for Tomato bharta. I tweaked it a little bit by roasting the tomatoes and the garlic, caramelizing the onions separately and then mixing it all together. It was unusually quiet on the blog last month, but it was frantic at home. Things flying, toys being put in boxes. Spices, food jars, some that even I didn't recognize, being evaluated to see if they would be moving. Yes, we're moving houses, moving the kitchen one house to another in Ann Arbor. Before we pack our bags and move, I want to say thank you to my kitchen that has sustained us for six years. This is place where I brought my two sons home, pureed, mashed, froze and fed them their first baby food. 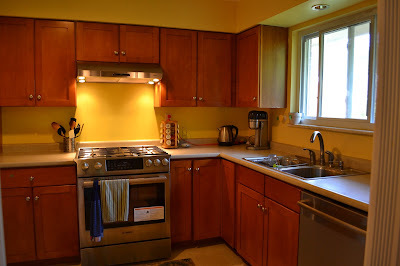 This is the place where cupcakes, cakes and popsicles were conceived, experimented, baked and eaten. This is the place we called home, with crayon marks on the wall, scrape marks from bumps and toys; with familiar corners, comfort zones and mess. Yes, it was a warm, messy house. You know what this post means, right? This means that my parents are visiting from India. Every summer I wait when they come to see what new recipe they will share with me. Just last week, I was making some cauliflower for dinner and as I got ready to clean up, my parents carefully kept all the cauliflower stems away. I've was expecting a Labra or mixed vegetarian dish. But I was in for a surprise. The cauliflower stems in this dish are cooked with big chunky potatoes and shrimp in a mustard sauce which brings out the best of the stems. The combination just works! The prep may take some time but the result more than makes up for it. Make it for the long weekend and watch your friends and family enjoy it. 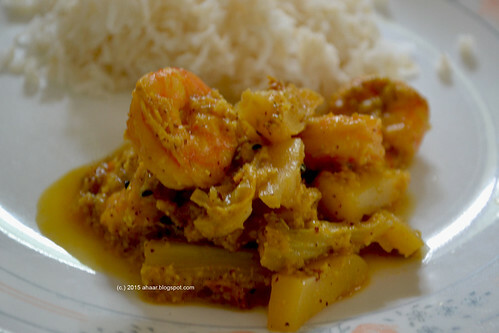 Mix the shrimp with salt and 1/2 tspoon turmeric powder. Heat 1 tbspoon oil and saute the shrimp lightly. Set it aside. 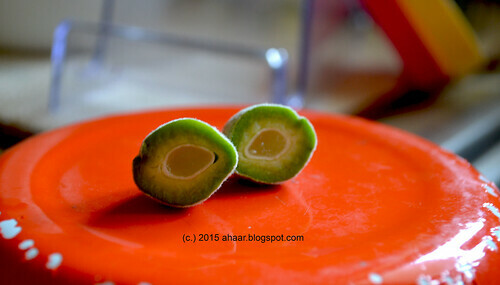 Grind 1 of the green chillies, garlic and the tomato together. 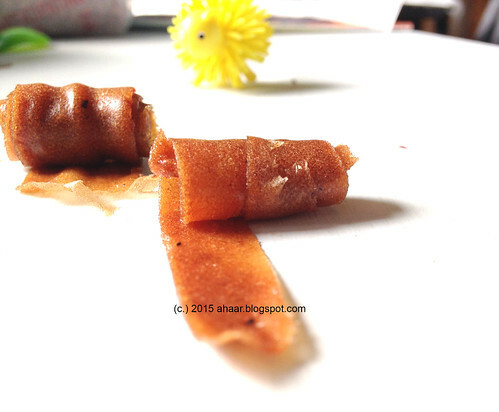 Then grind the the mustard seeds and posto with a little water till it makes a thick paste. 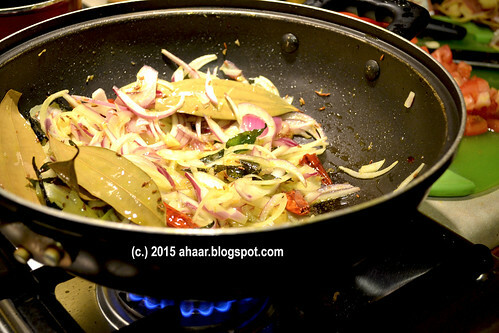 Heat the rest of the oil and temper it with the 2 green chillies and panch phoron. Then add the turmeric powder, and the potatoes. Let it cook for a minute or two. Then add the tomato paste and saute it for a couple of minutes. Add the mustard paste, cauliflower stalks and the shrimp and let it all cook together for another minute. Add salt and about 1/2 cup to 1 cup water (depending on the consistency you want) and close the pressure cooker. Let is cook for 1 whistle. 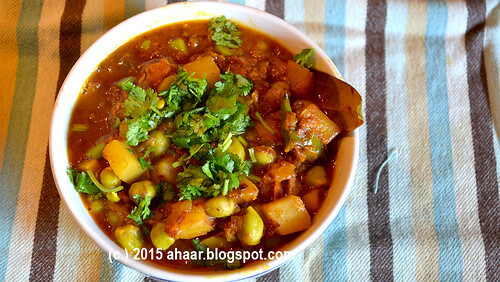 Then open the cooker and finish it with chopped cilantro leaves. For Day 2 of cookbook I've chosen one of my favorites - The essential Mediterranean cookbook, published by Bay books in 2003. This book captures the sunny cooking of Mediterranean countries, whether simple or complex, from all areas around this balmy sea. Full-color illustrations. It has gorgeous photos and unique recipes like this pine nut and honey tart. 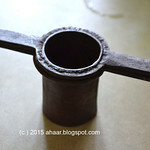 2. on the facebook page (facebook.com/ahaarblog). Bring out the streamers, balloons and face painting (yes, we're into that now a days). And don't forget the cake. Our little blog is turning nine. 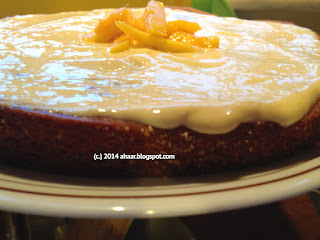 We are so happy that this repository of recipes and memories is still going strong. To celebrate we are giving away some cookbooks through out the week. I will post a picture of the cookbook every day. All you have to do is leave a comment either on the blog (ahaar.blogspot.com) or on the facebook page (facebook.com/ahaarblog) to tell us how you found us. Thank you for your love, comments, shares, likes and lessons. We grow each day, and have enjoyed every year of the journey. Here is today's book - Perfect Tapas. Published by Parragon, this book has a selection of the very best tapas recipes to inspire you. 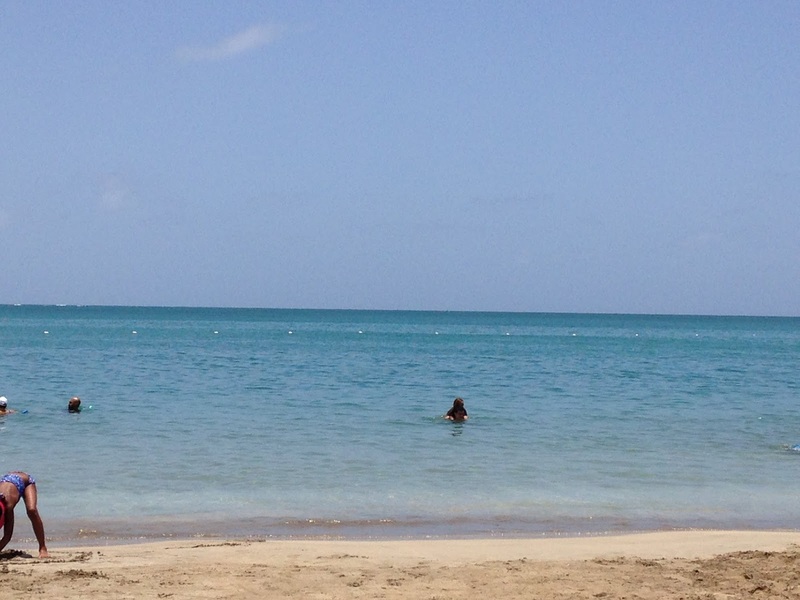 The blog hiatus was not planned. We were taking a vacation end of May and things got really busy before and after vacation. Work to be finished, clothes to be packed etc. I look at the blog and see it's almost been a month. Let me tell you about our vacation briefly. 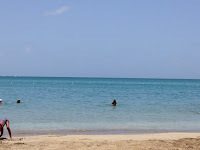 We went to San Juan, Puerto Rico and spent about 5 days there. The beach was a couple of blocks from the apartment and the kids were ready to go to the beach at 8:00 in the morning. We were there by 9:00 and spent the next couple of hours digging sand, wading in the waves and came back tired and hungry. In the evening, the kids went to a park close by and chased pigeons and jumped from bronze shells. It was a lot of fun. The food was amazing too. 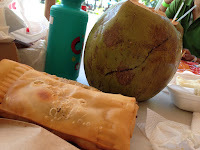 Papayas and mango for breakfast, and a whole variety of empanadas, coconut water was to be had. The chicken in the empanadas were nicely spiced and I quickly became a fan. If you are in Puerto Rico, you have to try mofungo, part of Puerto Rican cuisine. 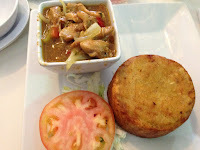 My favorite was the one I had in El Jiberito, a long-standing popular restaurant in Old San Juan. Theirs had raw plantain, sweet plantain and cassava. The biggest revelation was Lil A's food choice. I ordered plain rice, chicken tenders, you know, kids meals. Instead, I ended up sharing most of my meals with him. He was more interested in Salmon with tamarind sauce, chicken with creole sauce. We came back happy and tanned and are slowly getting back to the routine. How has your month been? 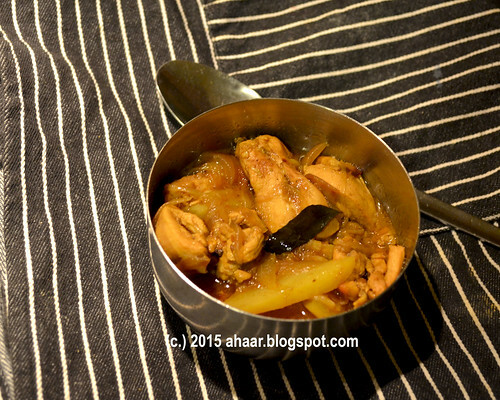 Today, I want to share the recipe of tamarind and pepper chicken the one I made for Kerrytown Saturday. I used fresh ground black pepper and the sour comes from tamarind and some tomatoes. 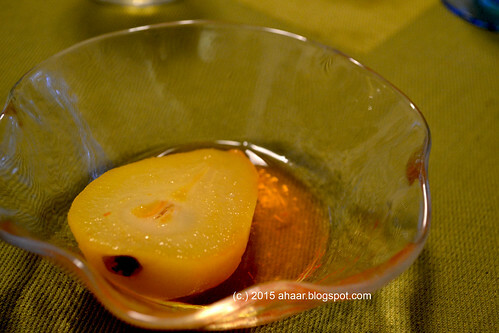 The tomato sweet and sour balances out the tang of the tamarind. 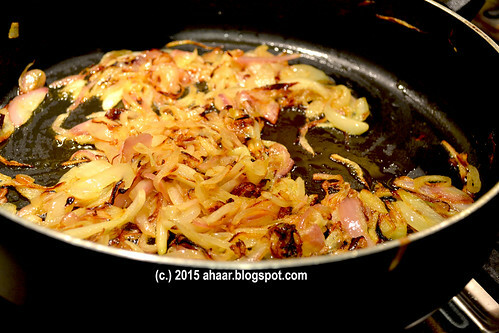 Add 2-3 tbspoon oil and saute slices from one onion for about 5-6 minutes till they start to turn brown. Take it out and keep it aside. Then dry roast the garam masala powder ingerdients till the aroma comes and grind it. If there is anything extra, keep it in an air tight box and use it later. 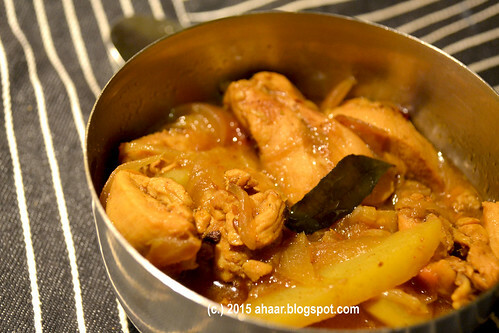 Marinate the chicken pieces in salt, half of the turmeric powder, 1/2 tspoon black pepper and 1/2 tspoon garam masala powder, half of the ginger, garlic paste and keep it aside for an hour. Cut the potatoes in long slices. Heat oil and saute the potatoes for a couple of minutes till the raw smell goes. Then take it out and keep it aside. 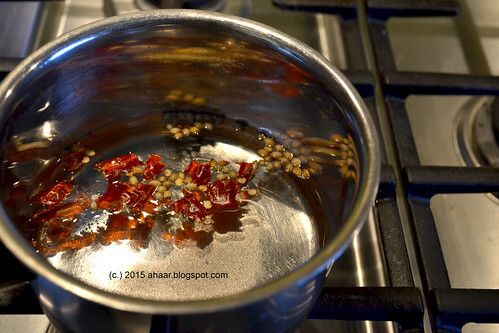 Heat the rest of the oil and temper it with cumin seeds, curry leaves and bay leaves. Then add the ginger garlic, paste, the dry red chillies. Saute for a couple of minutes. Then add the slice onions and saute till it starts to turn soft. Add the tomatoes, turmeric powder and 1/2 tspoon garam masala powder and 1 tspoon black pepper powder. Let it cook on low heat for good 5-6 minutes till it all comes together nicely. Now add the chicken pieces and let it mix together with the spices. Add the tamarind paste and cook it covered for 3-4 minutes till the chicken starts to brown. Now add the browned onions, with a cup and half of water, potato slices. Mix it all together and cook on low heat for 8-10 minutes till the chicken turns soft. Add the rest 1/4 cup garam masala powder, cook for a minute and take it off the heat. Taste best with some plain rice. 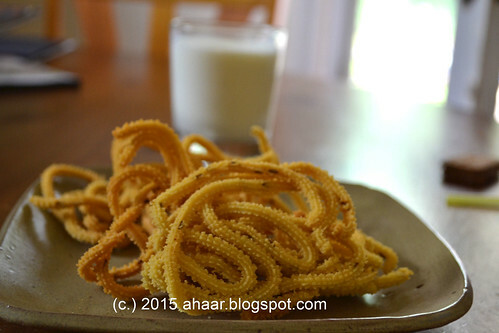 After nearly nine years of blogging, I am excited about launching a new food venture! 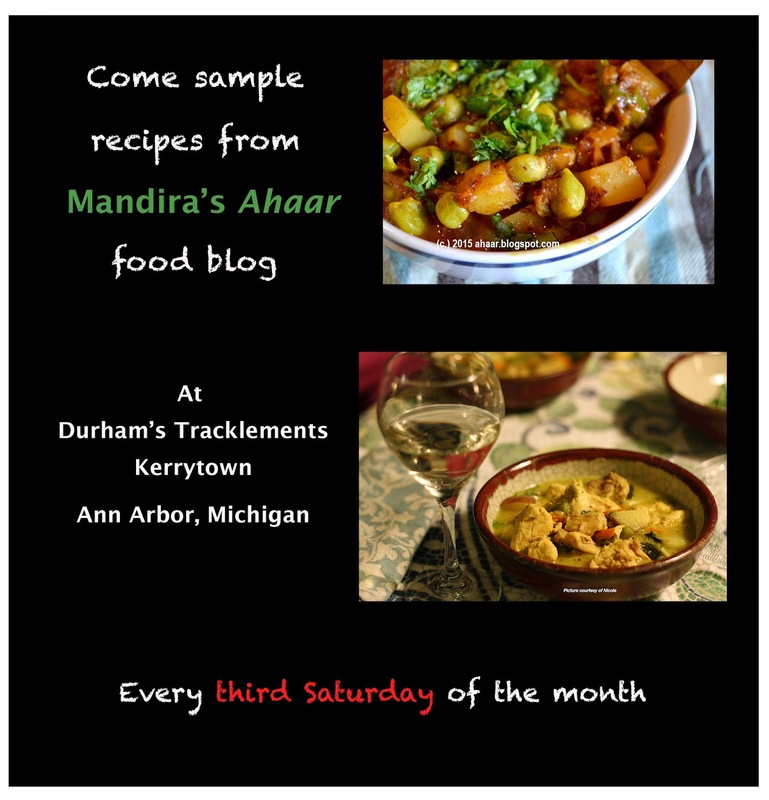 Every third Saturday of the month, I will be cooking some of my favorite recipes and bringing it to Durham's Tracklements in Kerrytown, Ann Arbor. Last week we went to Detroit to see the Diego Rivera and Frida Kahlo exhibit at Detroit Institute for the Arts. It was a beautiful, inspiring and amazing experience looking at all the painting and the two artists journey in 1930s Detroit. I saw a whole different city different yet similar to today's Detroit . I also loved the 3-minute silent films which captured the city, the artists and their work. Diego Rivera, best known of the Mexican muralists, to Detroit in April 1932, accompanied by his much younger wife, Frida Kahlo, also an artist. Over the next 11 months, Rivera researched, designed and painted the frescoes that cover the four vaulting walls of the museum’s courtyard, now known as the Rivera Court. It features heroic scenes of muscular workers and even more idealized earth mothers grasping sheaths of wheat or armloads of fruit. All told, the “Detroit Industry” frescoes are probably as close as this country gets to the ceiling of the Sistine Chapel. On the way back, we stopped by in different stores in Dearborn, eating and shopping. 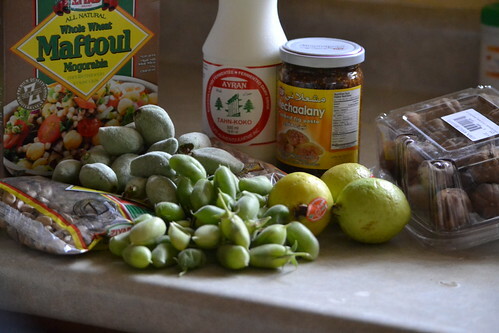 We had a wonderful lunch, some rose water ice-cream and picked up a whole lot of grocery at Middle Easter stores that I am going through slowly. 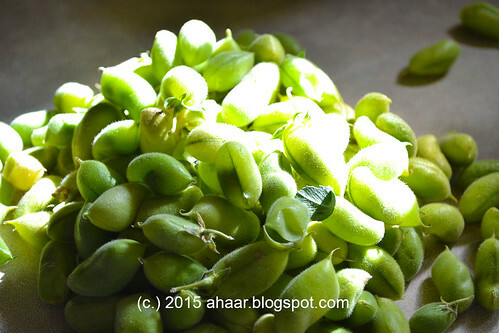 I picked up some fresh green chickpeas. 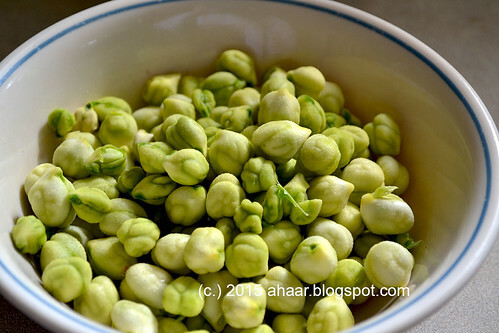 Nothing shouts spring like these chickpeas. 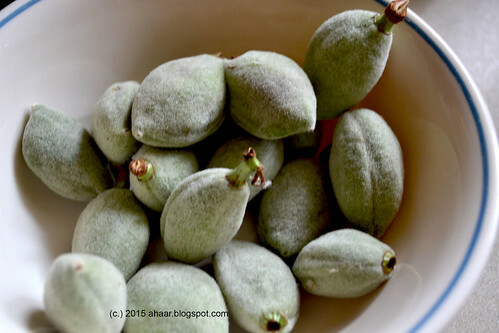 Fresh, crunchy and faintly aromatic they transported me to my childhood where I would roam through my mother's vegetable garden picking them up and eating them. My mother would shout, "wait for a few more days" from the window. So, of course after I had peeled them from their pods, I called my parents asking them how to cook these little chickpeas. 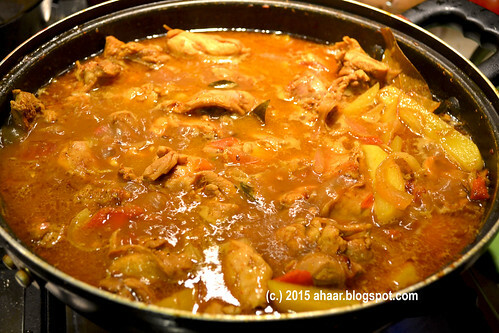 And soon a curry was bubbling away which made for a delicious weekend lunch. Put the shelled chickpeas in a pressure cooker with some salt and 1/4 tspoon turmeric and 2 cups of water and cook it for two whistles. Let it cool. 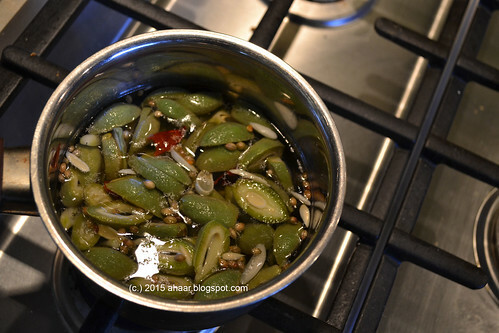 In another pan, heat oil and temper it with asafoetida, cumin seeds, bayleaves and green chillies. Then add the grated ginger and onions and saute it on medium flame for about 3-4 minutes till they start to turn brown. Add the chopped tomatoes, rest of the turmeric powder, cumin and coriander seed powder and saute it together. Close the lid and cook for a couple of minutes. Mix all the ingredients well and then add the potatoes and salt. Let it cook for another 3-4 minutes. Then add the chickpeas and 1 cup water from the pressure cooker. Let it cook for 7-8 minutes till the chickpeas and potatoes are cooked and the gravy starts to thicken. 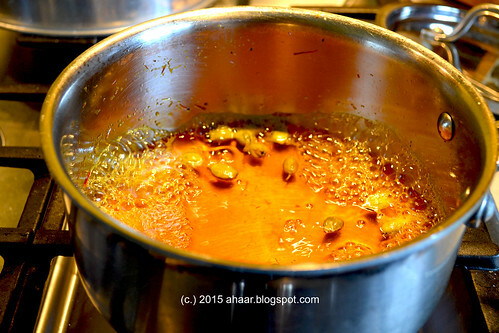 Add the ghee and take it off the heat. 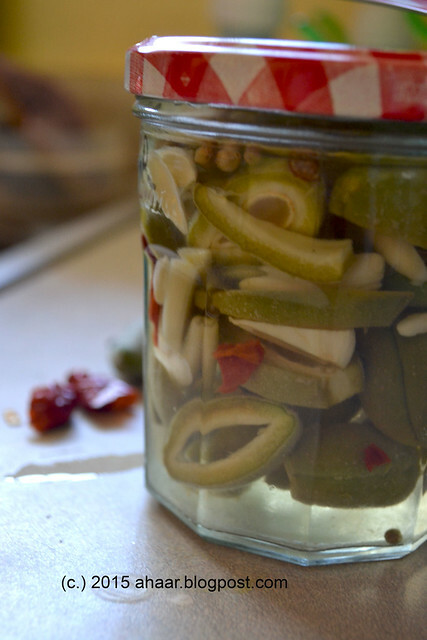 Garnish with chopped cilantro and serve warm. 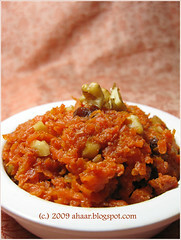 It goes well with rice and also with naan, roti and paratha.